I’ve lived with the pre-existing chicken run for two years. I liked the ability to let the chickens pick through the compost, but other than that I didn’t really like the run. The door was a little too low and would hit the ground whenever I tried to open it. The run was too low to easily get inside and clean it out – which meant it didn’t get cleaned as often as it should have been. It also got filled with snow this winter, and the chickens were stuck under the coop for at least a month. I decided that, with the additional mess of ducks, I should upgrade the run this year. To make the project easier, I purchased some lumber and corrugated roofing from Home Depot and started the process of rebuilding the run. I was able to reuse some of the lumber and all of the fencing – which kept costs down. I got the run mostly finished today. This week I’ll have to clean up the remnants of the old run (perfect for a bonfire) and clean up the fencing. I’ll also have to extend the run to cover a small section of the stream behind the house to keep the ducks entertained. Also on this summer’s project list is to redirect the gutter to dump downhill of the coop and run – hopefully also helping keep the place clean. I left the compost bin mostly untouched – in two years or so, it will probably need to be rebuilt. 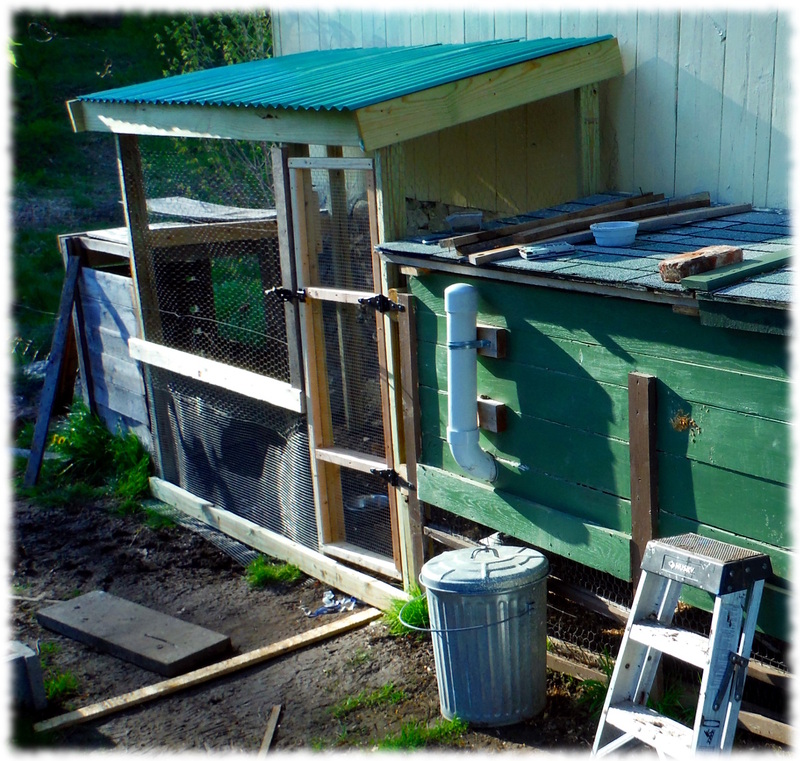 A nearly completed upgraded chicken run. The interior has 6 feet of headroom, so it will be easy for me to get in the run and clean.